It’s just one of those weeks. The kind where I bought 2 bottles of shampoo, thinking I had a conditioner. And my alarm was set for early o’clock more often than not. 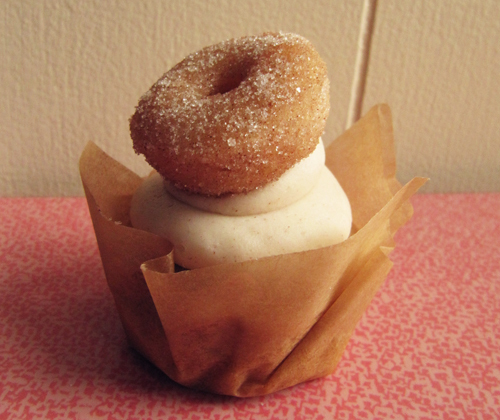 But it’s all good now because we have cider and donut cupcakes! And tomorrow is Jake’s birthday so we are going to eat good food and go on adventures all weekend. And fall is the best time for birthdays. Because then you can have cupcakes like these in your life. You see, I made these for my friend’s birthday. It makes me wish my birthday was in the fall. Keep your eye out for Jake’s birthday goodness. I’m making him two birthday treats tonight! 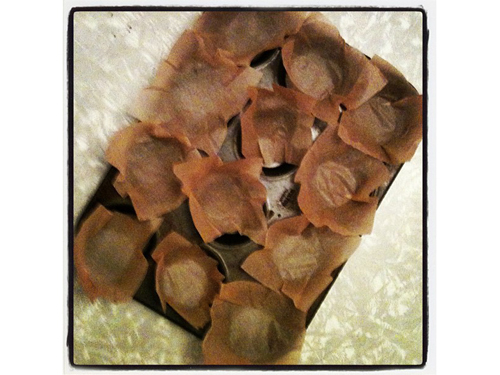 Line a 12 cup muffin tin with paper liners (or parchment squares like I did) and preheat your oven to 350F. In a large bowl cream together the butter and sugar. Add eggs and beat well. Add the baking powder, cinnamon, and salt and mix until combined. Alternately add the flour and apple cider until mixed welll. Fill each muffin cup 3/4 of the way up. Bake for 20 minutes or until a toothpick comes out clean. Set aside to cool. Pipe frosting onto your cooled cider cupcakes! 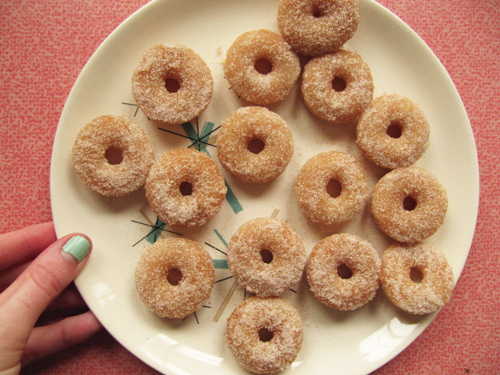 These totally taste like mini (baked) cider mill donuts! Preheat oven to 350F. Lightly grease mini muffin pan with cooking spray. In a small bowl, whisk together flour, baking powder, salt, nutmeg and cinnamon. Pour into egg mixture and stir to combine. Add canola oil, milk, and vanilla extract. Pipe into the molds of a mini donut pan, filling each about 1/2 full. Bake for 6 minutes (rotating half way through) or until a tester inserted into the center comes out clean. Remove the donuts from the pan. Brush with melted butter and roll through cinnamon sugar. Top cupcakes! 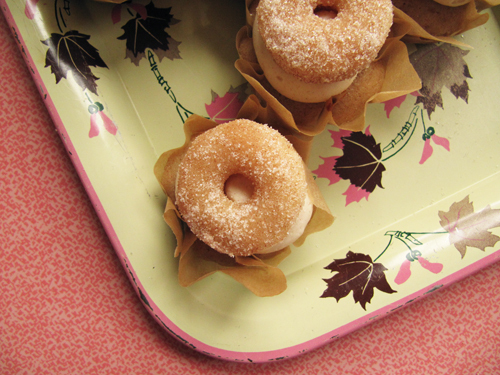 Note: This mini donut recipe will make way more than you need. Feel free to cut it in half! Or make as many mini donuts as you need and then use the rest of the batter to make mini muffins, and bake those for 10 minutes. 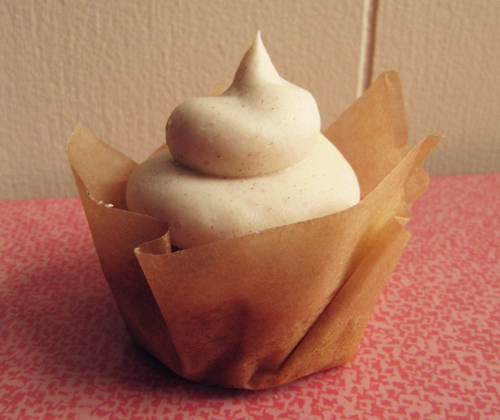 Parchment works out so good for cupcake liners! Just tuck 3-ish inch squares in each nook. Oh, you just have to! And thanks, Pants! it’s a cupcake topped with a donut! when it comes to baking, you’re just such a smartie! these are the cutest and I can’t wait to see some cream canoes all up in this place! Oh, Sarah, you totally should! And then let me know what you think. Cindy – I’m going canoeing this weekend! 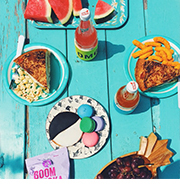 In the snack way. Oh wow I thought you used those tulip paper liners…. but its juce parchment? I will do this next time. they look so cute and rustic… perfect for fallish cupcakes/muffins. 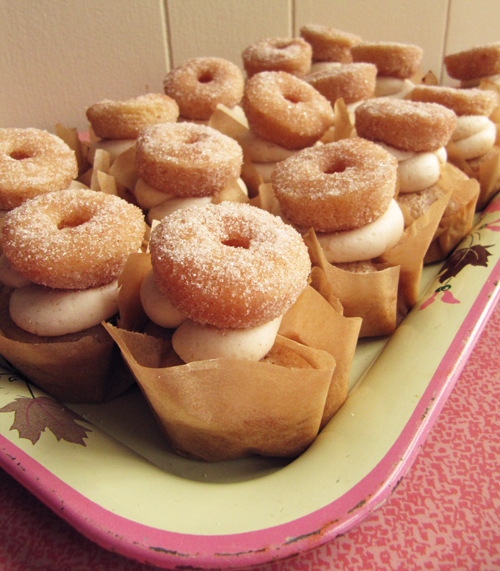 As for your cupcakes… those are probably good all on their own but topped with a donut?!?! I’d be in heaven! You’ve really outdone yourself this time. Every piece of that cupcake is special in itself, but add them all together? Wowza. Have fun this weekend! This is a breakthrough! Donuts and Cupcakes! Breakthrough, i say! This is a breakthrough! Donuts and Cupcakes! Breakthrough, i say! Unless this is a duplicate comment. So cute and I bet my family would love them! These look like HEAVEN! I’ll definitely be trying these next week. Thanks! Oh cool Jesica! Let me know what you think! Those look delish, I’m going to have to make them! 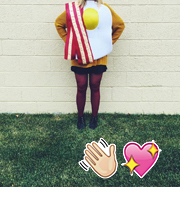 I am beyond obsessed with your blog, and this recipe! Cannot wait to try and make these! It’s looking delicious… I will make this soon.